Last night I watched, with great interest, The Plantagenets on BBC2, presented by Professor Robert Bartlett. After the castle-building exploits of Edward I and the red-hot-poker-up-the backside story of Edward II, we were approaching that part of English history which fascinates me above all others. The Black Death. Now, I’m a great fan of Professor Bartlett. In fact his series, Inside The Medieval Mind, inspired my novel PLAGUE LAND, so I was very eager to hear his opinions on the Black Death and its effects upon Plantagenet rule. I was, therefore, disappointed when he skipped effortlessly from the battle of Crécy in 1346 to the territorial gains in France of 1360. Where was the catastrophe that killed half of England between 1348 and 1350? Surely it deserved a mention? I suppose, when you are making a 3-part series that covers the best part of 300 years, it’s impossible to address everything. And, as I write this, I’m yet to view the third and last programme – so perhaps Professor Bartlett will cover my favourite topic next week? If not, here is a broad outline as to just how much the Black Death changed society in those intervening years. The biggest effect of the Black Death was to hasten the decay of feudalism. Feudalism was already proving a problematic and inefficient way of managing the farmlands of England – yet it remained the spirit of rule. But with so many dead in the aftermath of the Plague, the barons and lords were suddenly short of labour. The tables were turned, and now the poorest in society – the villeins – suddenly had the bargaining power to negotiate higher wages. It was pure supply and demand, and though the king and parliament tried to control wages, with a law pinning them back to their pre-plague levels, this law was generally flouted by landowners who were desperate to induce their workforce force to stay on their estates. If this were not a big enough hit for the nobility, they also soon found that their rental incomes were significantly reduced as their tenanted properties were now only half-filled. Harvests were left to rot, mills were idle and livestock was left untended. Already a social disaster, the Black Death was soon becoming an economic one. Rampant inflation followed. Half the population might be dead, but the same amount of coinage remained in circulation. With poorer harvests, food became more and more expensive, which in turn resulted in even higher wage demands. As wage control failed to work, people were willing to move from the villages where their families had lived for many generations to other estates, attracted by the higher wages on offer. Even priests would move parishes for higher stipends. I’m writing my second book, The Butcher Birds, against the backdrop of this turbulent moment in history. The poorest in society were suddenly mobile and aware of their worth. Also, and perhaps most importantly, they had the desire to seek something better for themselves. They had survived the Black Death, and were determined to use this opportunity to make the most of their survival. As often happens in history, there is a flowering in the aftermath of a tragedy. This new self-confidence made the poor difficult and recalcitrant; I can just imagine the knights of the garter and Edward III sitting around at Windsor and complaining about the commoners, grumbling that their demands were both troublesome and impudent. 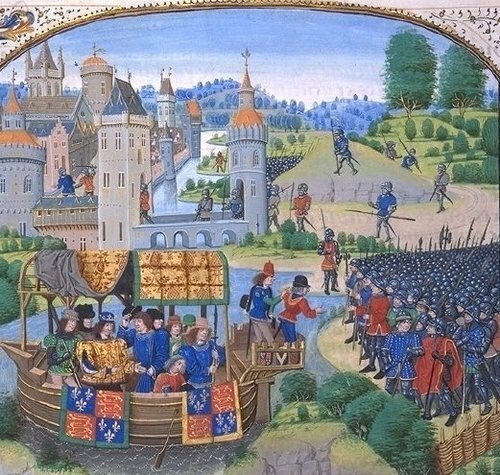 It was an impudence that would eventually lead to the Peasants’ Revolt of 1381, when the villagers of England rose against their masters for the first time. The revolt was ultimately suppressed by the Plantagenet boy-king Richard II, but it was an uprising which had its seeds in the Black Death. So perhaps it deserved a mention on television last night? I think so. S D Sykes’ debut novel, PLAGUE LAND, will be published in hardcover and as an eBook by Hodder & Stoughton on 25th September, 2014. You can follow S D Sykes on Twitter here.